American and Chinese Dishes. Finest & a most unique Chinese American restaurant. Home of authentic Chinese dishes, prepared to satisfy the most discerning epicure. Dine in a scenic atmosphere of calm. 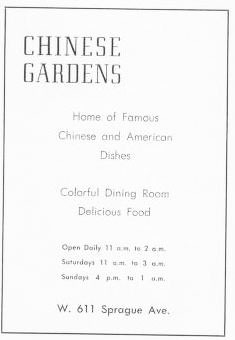 Home of famous Chinese and American Dishes. Colorful Dining Room, delicious food.